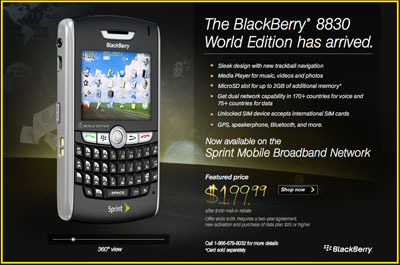 BlackBerry has lunched a new phone Sprint 8830 mobile with full QWERTY keyboard. BlackBerry Sprint 8830 comes with 2.5 inches TFT 65K color display with 320 × 480 pixels resolution, the Sprint 8830 features instant messaging, music player, call recorder, 1400mAh Li-Ion battery for long time battery backup. This device supports browser, PDA and instant messager. You can send and receive any mails through any POP3 e-mail account. It is complete QWERTY keyboard, microSD slot, landscape QVGA display and media player but no camera.